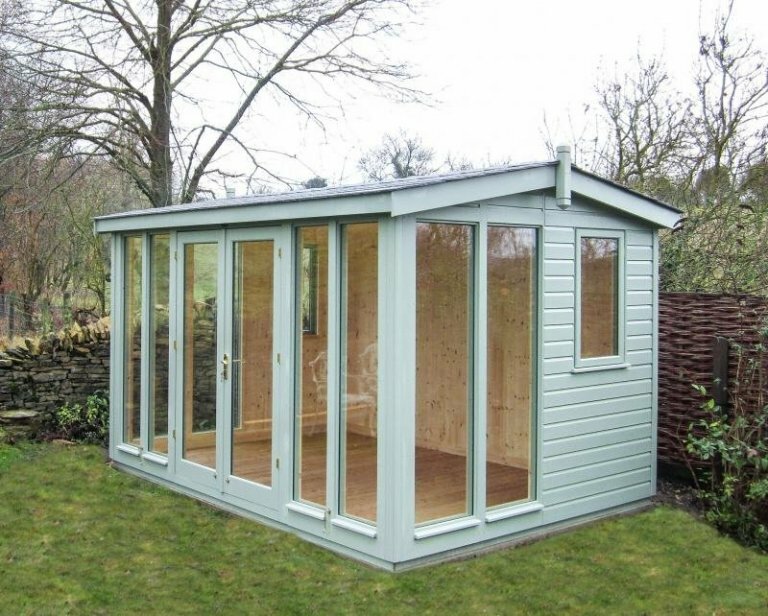 A wonderful blend of modern and traditional, this 2.7 x 3.6m Burnham Studio has been installed at the bottom of our customer’s lovely rural Oxfordshire garden in Radford, to use as a comfortable garden retreat, thus allowing them to enjoy their garden more. 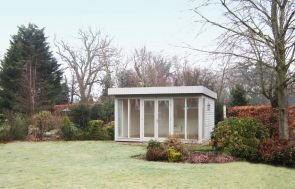 Our Garden Studios all come with full insulation (walls, ceiling and floor), double glazing, matchboard lining, and draught excluders in the doors and windows, making it perfect to use as an office, hobby room or comfortable relaxation room. Full-length glass windows and doors that carry on around the sides give the Burnham its modern touch, allowing plenty of light inside and offering unhindered views when gazing outside. The apex roof, with the customer’s choice of grey slate effect roofing tiles, gives the building its traditional element. The customer chose to have extra windows put in the gables, which are taken from our Langham Garden Studio. They are half height windows, which the customer preferred over the fanlight windows that usually come with the Burnham. The paint colour the customer chose is Lizard, which is a natural green colour that offers an opaque finish from our Valtti Paint Range. For more information on our Burnham Studios, or if you would like to come and see our Garden Studios for yourself, please come and visit our Burford Show Centre. 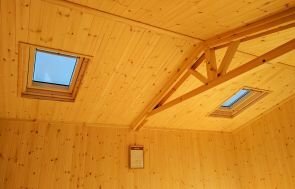 Alternatively, please call us on 01760 444229 and our friendly team will be more than happy to discuss your building requirements with you.